Scenic flight over the world's highest mountain series.. Magical experience of being over the Himalayas..
Scenic helicopter flight over the world's tallest mountain series.. Round flight of the Everest Base Camp at 5,320 meters. Breakfast at the Everest View Hotel at Shyangboche..
Trek through remote wilderness and traditional villages in the Dhaulagiri Himal. Cross two spectacular high passes and embark on a glacial traverse. Walk to Hidden Valley via French Pass for a true sense of isolation, where Sita Chuchura and Tukuche Peak West flank us, and Dhaulagiri I, Mukut Himal and Tashi Kang stretch to the sky. This is one of the world’s great classic treks, with the additional challenge of reaching Gokyo Lakes. You’ll be accompanied by an experienced trek leader along with assistant guides and porters, who will not only give you all the support and guidance you need along the way, but also introduce you to the rich local Sherpa culture.. Experience an adventurous and stunning helicopter flight to Everest Himalayas. Breakfast at Everest View Hotel, the world's highest hotel. View Everest Base Camp then do a quick landing at 5400 meters (near Kalapatthar). Fly to the top of the world on a scenic flight over Mount Everest. Enjoy window seats for every passenger on small group tours. Get spectacular views of the Himalayas, including Mount Everest, Lhotse, Makalu. Explore remote trails of far western Nepal on the final stage of the GHT. Witness the beautiful setting of Rara Lake. Be mesmerised by the remote Yari Valley. 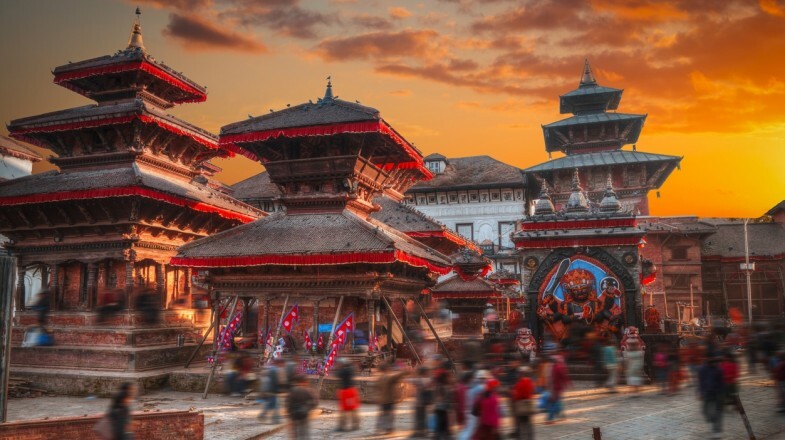 Booking a trip to Kathmandu means you will get to discover one of the most captivating cities on Earth. The Nepalese capital is brimming with centuries worth of otherworldly culture, art and architecture, all residing in a city that never misses a beat. This is why holidays in Kathmandu will be an absolute delight for every independent, adventure-seeking explorer as the city is versatile for all types of travelers from luxury to budget. Located on the Bagmati River, some 5 km south-east of the city center, Pashupatinath Temple is a Hindu temple dedicated to God Shiva. It is one of the holiest sights in the entire country and attracts many pilgrims from South Asia especially during Shivaratri, an annual Hindu festival that celebrates Shiva. Kathmandu Durbar Square is the heart of the Nepalese capital. This colorful plaza is home to several significant sights, including the Living Goddess Kumari House, Taleju Temple and Bhairab Temple. The Durbar Square suffered massively during the April 2015 earthquake and is currently undergoing renovation. Boudhanath Stupa lies 5 km north of Kathmandu city center. The massive 5th Century Stupa is one of the most important pilgrimage sites for both Hindus and Buddhists in Nepal. Swayambhunath Stupa is another majestic sacred structure which overlooks the city from a tall hilltop. At the so-called site of “Sublime Trees”, you will find lush vegetation and an intriguing blend of Buddhist and Hindu imagery. Air in Kathmandu is notoriously dry, dusty and polluted, especially during the dry season (October to May). If you find yourself experiencing respiratory difficulties, make sure to wear a face mask whenever you go outside. Other than getting around on foot, the most convenient methods of transport in Kathmandu are rickshaws and taxis. Most tourist areas are serviced by rickshaws, while taxis are found all across the city. Don't be shy to haggle with the cab drivers. In order to avoid water borne diseases, it is advised not to drink tap water while in Kathmandu. Make sure to always equip yourself with plenty of water bottles, especially if you plan on spending prolonged periods of time trekking or sightseeing. It’s also best to avoid consuming ice, salads and pre-cut fruit in restaurants. If you are in Kathmandu for a short time, do consider going for short hikes around Nagarkot and Shivapuri Nagarjun National Park areas.